Kado Muir, at left, of the Western Australia Nuclear-Free Alliance joined the walkabout. Photo by the Australian Broadcasting Corp. 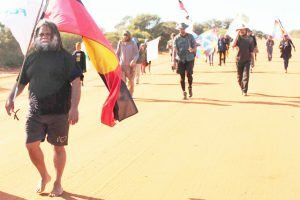 In the state of Western Australia a group that reached over 50 at times left Wiluna by foot led by Wangkatja Indigenous elders of the Goldfields region. For the eighth year in a row the Walkatjurra Walkabout hiked through four areas threatened with uranium mines to amplify the voice of indigenous traditionals and local organizations that have struggled for decades to remain nuclear-free. In 2017, a state ban on uranium mining was declared by the government of Western Australia except for four proposals at Kintyre, Yeelirrie, Wiluna and Mulga Rock. The strength of local anti-mining movements has set back all four mining plans, none of which have received final approval. While there is no uranium mining in Western Australia, the walkers want it banned completely before any of the proposals are developed. The 155-miles walk ended in Leonora Sept. 3. Along the way walkers met with communities that could be impacted by the mines and shared stories from their struggles. “The Walkatjurra Walkabout is a pilgrimage across Wangkatja country in the spirit of our ancestors, so together, we as present custodians, can protect our land and our culture for future generations. My people have resisted destructive mining on our land and our sacred sites for forty years,” said Kado Muir, one of the walkers.